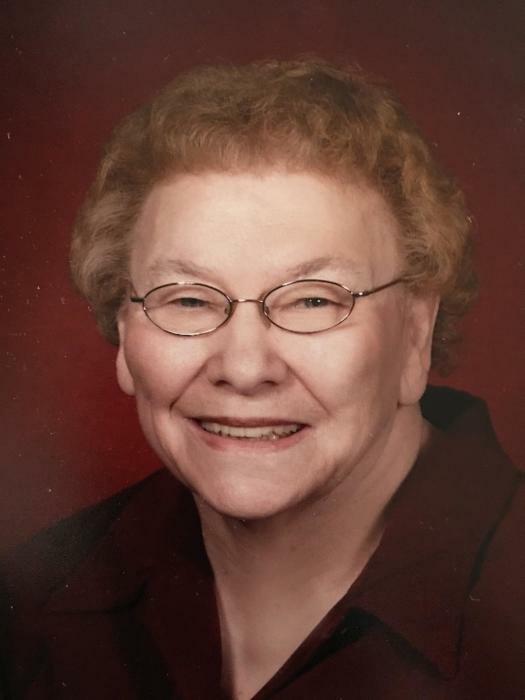 Valeria Lois Schultz, age 89 of Belle Plaine, was called home to be with Jesus on Saturday, January 19, 2019 at the Ridgeview Hospital in Waconia. The memorial service will be 2:00 p.m. on Saturday, February 2 at Trinity Lutheran Church in Belle Plaine. Visitation will be one hour prior to service time at the church. Interment will take place at a later date in the Evergreen Cemetery in Alexandria, MN. She was born on February 3, 1929 to Bernhard “Ben” and Gertrude (Gehrke) Stockmann in Fernando, MN. She was baptized as an infant at St. Matthew’s Church in Fernando. She attended country school and graduated from Stewart High School in 1947. She became a practical nurse while employed at Loretto Hospital in New Ulm. She met the love of her life, Harold W. Schultz, at George’s Ballroom in New Ulm while he was home on leave from the Air Force in 1951. On November 28, 1952 Valeria and Harold were married at St. Matthew’s Church in Fernando. The couple lived in New Ulm for a short time, and in 1953 they moved to Fairfax, MN to help run a turkey farm. Later Valeria worked with Harold at the Fairfax Nesbitt's bottling company while being a homemaker and raising their family. Later in 1965, they moved to Alexandria where they ran Schultz's Tourist Home and worked for Coca Cola Beverage Distributor Company. Valeria was known for her "eagle eye" bottle inspecting. Valeria was a charter member of St. Pauls Lutheran Church in Alexandria and served her Lord in many ways at the church. After retiring in 1991, the couple moved to East Fork, AZ where Valeria worked as a librarian at East Fork Lutheran High School for one year. For the next ten years they helped the "Builders for Christ" build 29 churches around the United States. During this time, they took six trips to Japan to remodel churches on the mission field. Valeria enjoyed crocheting, dancing, fishing and playing Yahtzee. She also was known for teasing with the nursing staff at Kingsway and the Lutheran Home in Belle Plaine where she lived since 2007. She is survived by her children, Joyce (Randy) Lendt of Nicollet, Gary (Tina) Schultz of Fargo, ND, Glen Schultz of Elk River, MN, and June (John) Hering of Rowlett, TX; 8 grandchildren; 4 great-grandchildren; brother, Jim (Jan) Stockmann of Hutchinson; sister-in-law, Marlene Stockmann of Stewart; and many nieces and nephews. She is preceded in death by her parents; husband, Harold in ’02; brother, Maynard Stockmann; and by all of her in-laws on her husband’s side. In lieu of flowers, memorials are preferred and may be sent to Joyce Lendt P.O. Box 642 Nicollet, MN 56074. The memorials will then be distributed among the following organizations in Valeria’s name: WELS Kingdom Workers Builders For Christ, WELS Church Extension Fund, and Martin Luther College Endowment Fund.